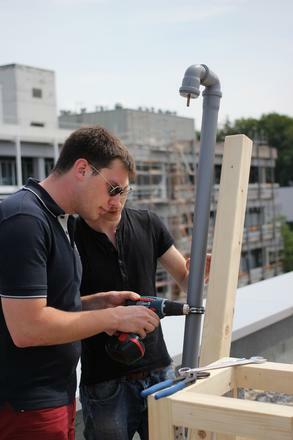 In the summer of 2013 we built our first prototype on the roof of the Center of Smart Interfaces at the TU Darmstadt and equipped it with measurement technology. 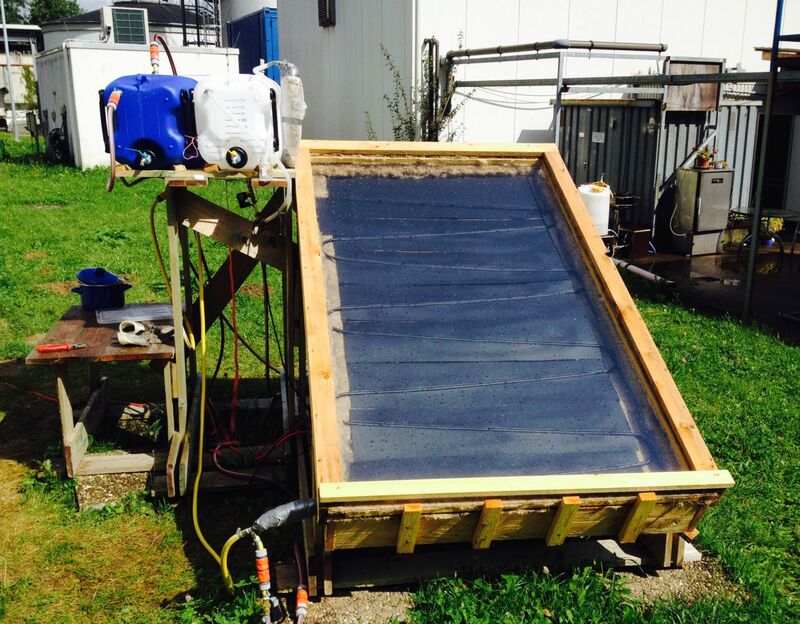 The prototype was run with a closed water cycle, where the output water was collected and used to refill the input tank. The throughput was measured with a pressure sensor. We also collected data about the solar radiation, as well as temperatures at different points of the water cycle and the absorber. Over the following weeks and months we used this data to validate our thermodynamic model and the associated calculations and improve the construction. Parts of the data can be found in the scientific publication. The focus of the operation of the prototype was laid on potential weaknesses of the system and insights on the aging of the used materials and necessary maintenance. 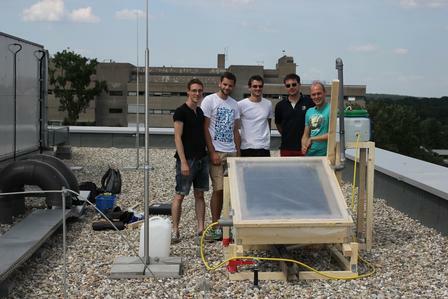 In the following summer we used the prototype to test alternative construction techniques and materials. We were able to test alternatives for the building process of the absorber and the cover and were able to evaluate the experience of the prototype construction regarding the manufacturing techniques. In the same summer of 2014, all the improvements were used for a new construction which was realized as the first final version in form of another prototype. This construction was used for microbiological tests with the support of the IWAR institute at the TU Darmstadt, as well as Entega. We developed a test plan to examine the performance of the system. Using time switched pumps and valves the system was run totally automated. 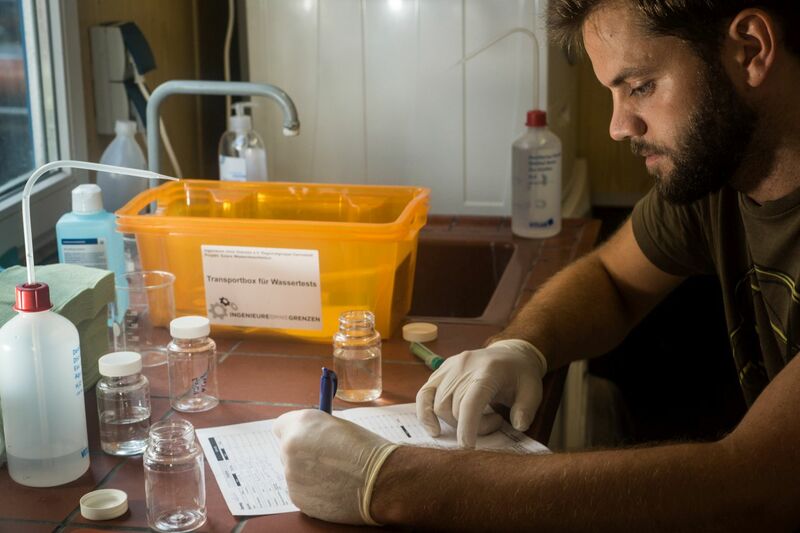 We chose different dilutions, up to very dirty water as input for the system, in order to test even higher contaminations than what is expected for a normal day to day usage of the system. Over a period of multiple months data about different parameters was collected multiple times a day, among others the amount of water, concentration of germs, turbidity and pH-value. The results of these tests are summarized at technical data (6.2 and 6.3).